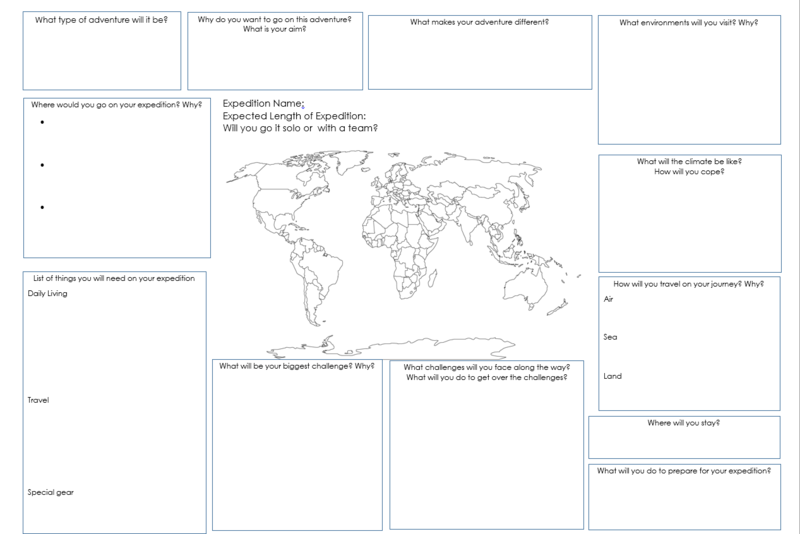 This term year 8 have been studying the world of exploration and adventurer. I found this great scheme of work and resources on the TES and have used it as the basis for this terms work. Whilst I did a lot to make the lessons suitable for my students, the resources were brilliant informative and engaging. 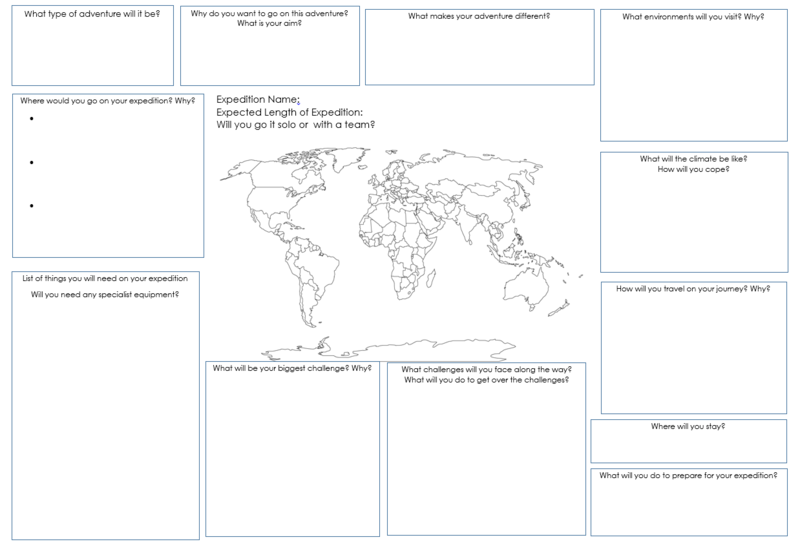 I liked the homework idea of the adventurer profiles and kept with them but made 3 templates for the students to choose from. I wanted them to investigate the types of adventure others have had and to understand their motivations and challenges. This worked well for the higher sets but some of the lower set struggled with the research, my fault really. Next year I will give some ‘fact-sheets’ to the lower ability students with key information and they just need to decide what information is relevant for their profile. My favourite part of the topic has to be the assessment. I want my students to want to explore the world, we’ve looked at an array of explorers and adventures throughout the past 100 years or so and now it’s their turn to design their own adventure. For homework the week prior to the assessment I have set them the task of coming up with their ideas and bringing in some research to aid their decision making. The homework set for each ability group was slightly different. Set 1 had the task of researching 3-5 locations they would like to visit on their journey, which had to include 2 different environments. This wasn’t limited to the destination but could also include the journey. I wanted them to also bring in some key information about their chosen locations such as daily/night-time temperatures, annual rainfall, hours of daylight etc to help them consider the challenges they might face. Set 2 were similar except the key information was suggested as a stretch and challenge task within the homework set. Set 3 were told to research just 1-2 locations they’d like to visit. I will be providing them with fact sheets on 3 different locations which they will choose from in addition to their own choices. In addition they were provided with a sheet of possible choices to support their research. Yes the National Curriculum underlies the basic ideas of the assessment but my main purpose of THIS assessment is to develop their interest in the wider world and their locational knowledge. I’ve noticed over the last few years that learners have a limited general knowledge of the world, often influenced through media and the likes. I want this to change which I why I was eager to develop a topic on adventure and exploration this year to inspire that interest and intrigue to the rest of the amazing features of our planet…. hopefully it might encourage some of them to take a higher role in conserving it. 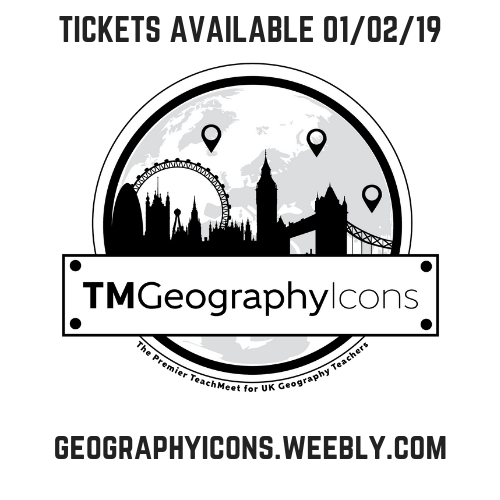 The assessment scenario is that the Royal Geographical Society* are running a competition to fund an expedition with a prize of £10,000. The pupils have to plan their adventure and complete one of two tasks based upon ability. 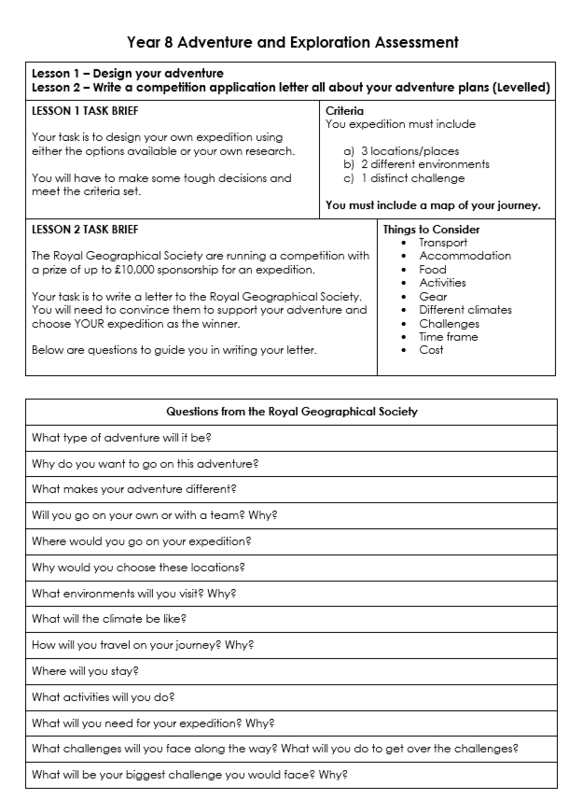 The higher task will be letter to the RGS outlining the adventure idea whilst the other task is to complete an application form about the adventure. This assessment is to be covered over two lessons. 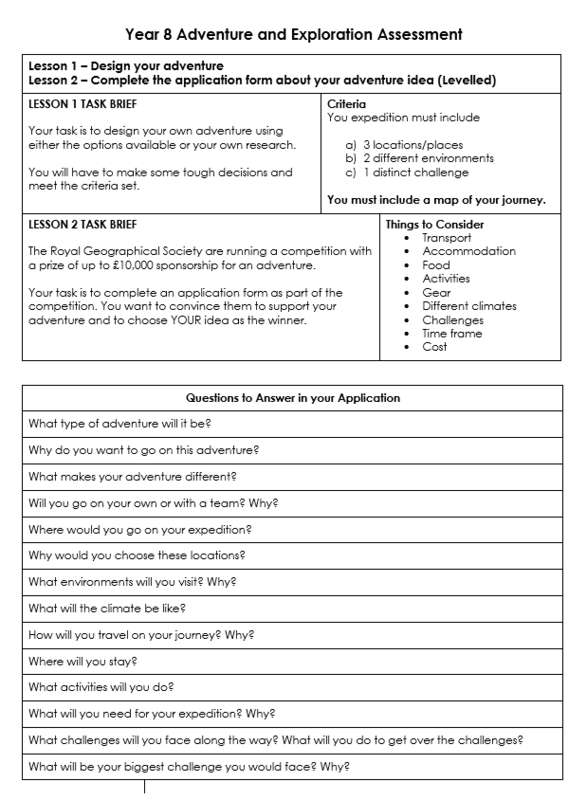 The first lesson is the so-called planning stage – pupils will be given an A3 sheet with a series of questions to enable them plan their adventure. I’ve two versions of the sheet, one with a few more hints than the other to direct thinking. The second lesson students will be completing the extended writing task. 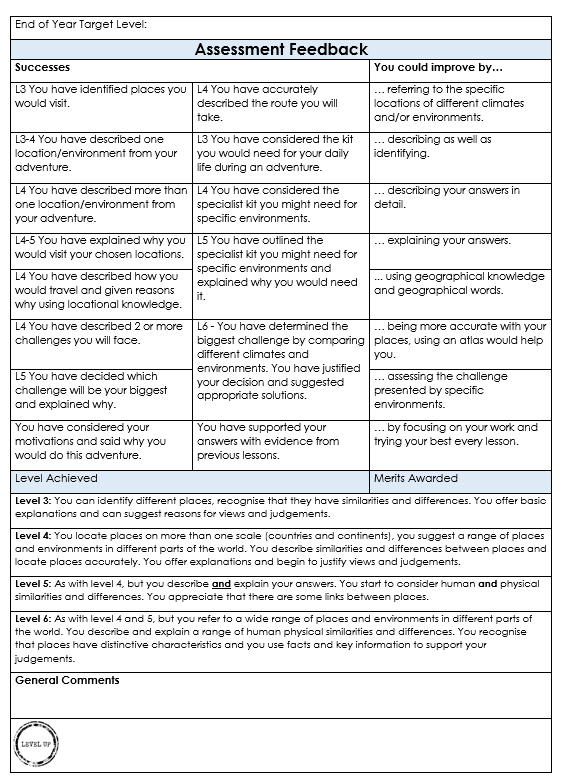 In addition I created a feedback grid to go with the application sheet to make marking less time consuming whilst giving success criteria for the levels. Last week after introducing the homework I had a number of students tell me there wonderful ideas, hopefully the rest will be as excited about this assessment next week. Thanks for visiting. Feedback welcomed. * please note the RGS are not running such a competition and have no affiliation with the resources produced here. 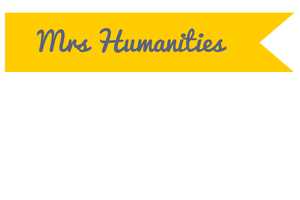 These resources are created by Mrs Humanities and is licensed under a Creative Commons Attribution-NonCommercial-ShareAlike 4.0 International License. Based on a work at https://mrshumanities.wordpress.com. 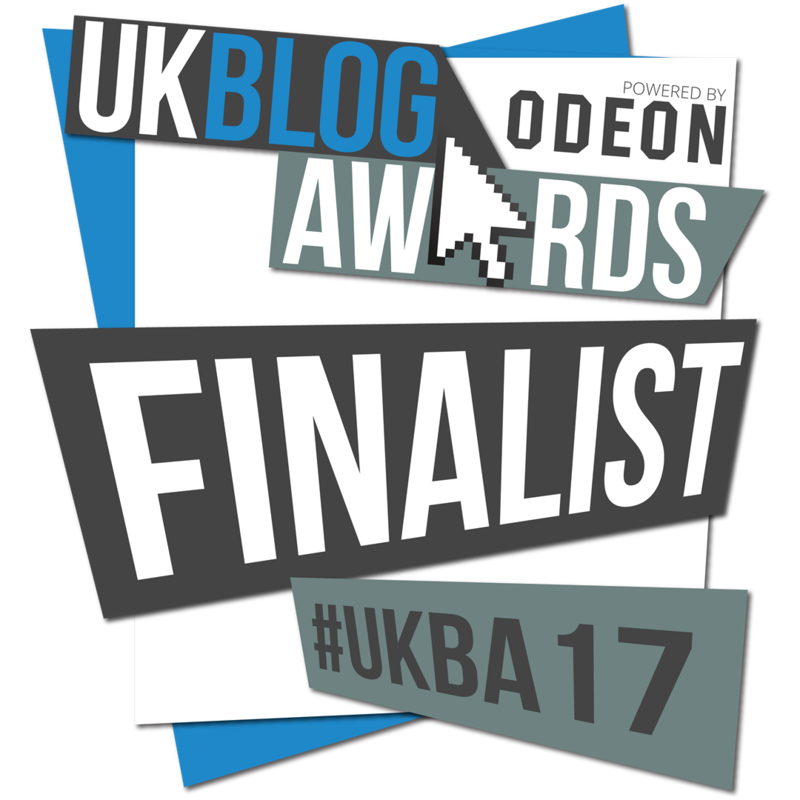 Categories: AFL, Geography, KS3, Resources | Tags: Assessment, KS3, Resources | Permalink.